These last 7 days have seen ups and downs for me. Here is a quick rundown. After my successful weigh-in last Friday, I decided to give myself the weekend off from heavy workouts. On Saturday I did attend a meeting of a group called Team 383. It is a group that was organized by Brian Fleming and Jackie Eastham. You can read more about the group here. Brian’s is an inspirational story of losing nearly 400 pounds through diet and exercise. His story has been featured in newspapers, magazines and TV shows around the world. As it turns out, I live just about a mile from him, and I was glad to finally connect with him and the local group. That meeting did include taking a walk around an indoor track, so I wasn’t completely without exercise. Sunday I slept in and skipped my workout. I did workout on Monday and Tuesday, but Tuesday was a bit odd. When I woke up that morning I had a slight sore throat. I didn’t initially think much about it, and went about my normal day. By the end of the day it was obvious that my cold had come back. Since then I have been battling it. Wednesday I worked from home and felt fairly miserable, and I did not work out. Thursday I was feeling much better and participated in a work-sponsored community service event at Forgotten Harvest. For the event I was on a team of about 30 people who re-packed 40,000 pounds of potatoes. We moved them from 2,500 pound bags into family sized bags. My job was to get them out of the 2,500 pound bags and into bins for bagging. It was back breaking work, but I really liked being involved. Later in the day we also sorted and re-packaged 6,000 pounds of red peppers. It was a great day to be sure. This morning I woke up sore from the event, and not 100% with my cold. My wife suggested I give myself one more day off from working out,so I did. With being away from my workplace, I also didn’t do much extra walking. Also this week my wife made some amazing Jambalaya. We had it as a meal twice, and a side dish once. It is really delicious, and very filling. I am a bit disappointed, but I know there are going to be weeks like this in this second year. The plan for the week ahead is to get healthy, and get back to working out. I also plan to be back in the office doing my laps in the morning, lunch time and end of day to keep my walking up. For today I am going to let my sore back rest, work from home, and enjoy the fact that my heating pad and ice pack are both nearby. This week I gave back some of the weight I lost, and I also gave back to my community. Considering everything, it was a good week. I am disappointed with the weight gain, but I know I am still on the right path, and those pounds will take care of themselves. This year for Lent I set a goal to give up between meal snacking. Since then I have modified to to just eliminate non-fruit or raw vegetable snacking. Sometimes, especially after some exercise, my body is craving something to refuel. Other times, though, it is just about boredom or habit that I want to snack. The truth is, it’s hard for me to avoid mindless snacking. A while back I suggested to a friend that she write a list of things to do instead of snacking. My suggestion was to put a copy of the list on the refrigerator or pantry where she stores her snacks. The idea is to see the list, and do something on the list rather than eating. I decided today to take my own advice, so here is the list I wrote for myself of 25 things to do instead of snacking. What items would you add to my list, or put on a list of your own? One year. One, magnificent, amazing year. Exactly one year ago today, I started on this journey toward better health. That same day, I launched this blog with this first post. I honestly had no idea whether the resolve to get a hold of my health, and to lose some weight would last a day, a week, a month or a year. To be completely and brutally honest, if you asked me to lay a bet that day as to whether I’d still be maintaining this blog, and working to be more healthy in one year, I’d have likely bet against it. Thankfully, I would have been wrong. Today marks exactly 1 year since I started this journey. In those 12 months I have had some incredible success. Here is a progress picture. 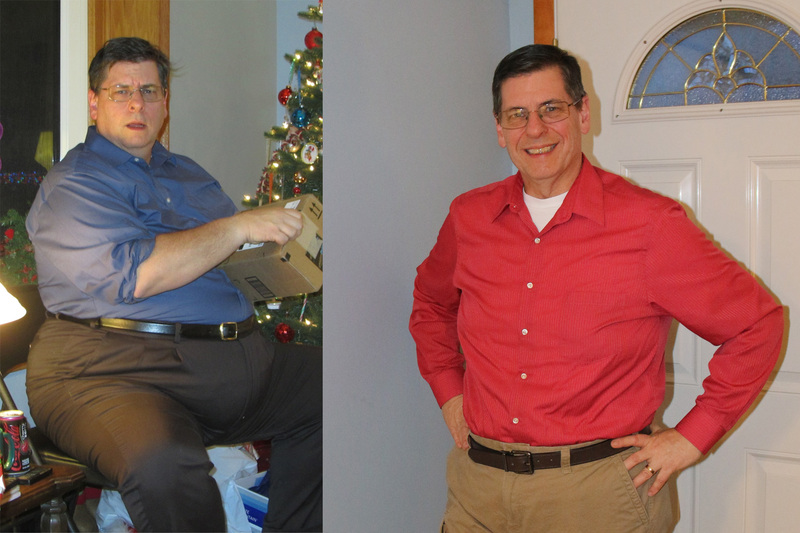 The photo on the left is from Christmas eve, 2013. The one on the right was taken last night. I honestly can’t believe how bad I looked a year ago. And, don’t ask me why I had such a bewildered look on my face, because I haven’t any idea. What I do know is that the guy on the left was always uncomfortable. He had bad knees, an achy back, high blood sugar and a crappy outlook on life. The guy on the right is still obese, but he is only 6 or 7 pounds away from shaking that stigma (hopefully forever). The guy on the right is confident. The back part of my tie (the shorter part) is longer now. My socks stay up better and don’t wear out as fast. Although I don’t know their names, I have “work out buddies” – other regulars who are at the gym when I’m there too. On the rare occasion that I have ice cream, I am picky, and I savor every bite. A pizza is no longer a round (or square) country to be conquered by my mouth. I can have just one slice. I know far more about what the front yards of people on streets near me look like. I cook more often. As I have learned how to make healthy food, I cook sometimes for my wife and myself. I actually give a darn how I look when I get dressed in the morning. I love life much more! I will have more thoughts on my journey in the coming days. One thing I know I want to write about is how my food choices have changed, and how I see food much differently than I did on March 1, 2014. When I started this a year ago, I wasn’t shy about telling people what I was doing. I am sure there are those around me who were hopeful of my success, but skeptical that I could do anything meaningful. As I said above, I’d be one of the people in that category. With one year under my now-smaller belt, I can say that I am far more optimistic than I was then, but I am also a realist. I know that if I take my eye off the ball for very long, I will slide right back into my former ways. I still carry a healthy dose of skepticism with me as I approach each day. Last night i did a bit of celebrating, I even had a tablespoon of ice cream. Today I plan to enjoy this Sunday with my wife, do some reading and writing, and think about how much I am looking forward to a very active camping and outdoor season. Week 52 Weigh-in. I DID IT! Back in October I was out on a walk. I was thinking about my weight loss goals, and looking to put some timing on things. As I was considering it, I thought “wouldn’t it be cool to weigh 228 on 2/28?” At the time I was about 255, and my running average for weight loss was almost 3 pounds a week, so I didn’t think much more about it. Of course, I did know that weight would start coming off much more slowly, and I was right. But, I put that goal in my mind. December came along, and I actually gained weight for the month. When I started the year, it didn’t look like I would make it to 228 by 2/28. Then last week, with just one week to go, I gained weight again and it wasn’t looking so hopeful, considering I had 3.6 pounds to go to make it. This past week I was very diligent. I missed a couple of workouts due to my cold, but I stayed on points all week. I tracked honestly and accurately. This morning I worked out, came home, stood on the scale, and it said 227.8 pounds! I made it. Tomorrow is actually 2/28, but my weigh-in is today, and today I came in under 228. I was stunned. I stepped on and off the scale 3 times to make sure I was reading it right, and it didn’t change. I showered, dried off, and stepped on and off two more times. The final answer… 227.8! My total weight loss is now 117.2 pounds, and I am at 34% lost of my original weight. I officially weigh 1/3 less than I did one year ago. My BMI is down to 30.89 (from a starting point of 46.79). I did some quick checking, and I am only 6.8 pounds away from no longer being obese! Now THAT will be a milestone! For the week ahead there are no particular challenges from an eating perspective. We are going to a party on Saturday, but I have become good at managing my way through those, so nothing to worry about. The keen observer will note that this is week 52, or 1 year since I started. I actually started on March 1, and I plan to write more extensively about the fact that it has been a year, on Sunday. Stay tuned for that post. My next two milestones are to be below 221.2, so I am no longer obese; and then to get to 218. When I lost weight in 2000-2001, the lowest I reached was 218. Those two goals are close to each other, and not that far off. I might set my sites on being at both by the end of March. How are you doing with your goals? What is driving you? When I left my office I said I wasn’t coming here. I told myself I would go home, maybe get some rest. I would be there when my wife got home so I could help her make dinner. Maybe do some chores. But here I am. All the way here I felt like I was on autopilot, like the car was driving itself. I felt pulled here, compelled to be in this place. Despite what I said when I was sitting at my desk, gathering my things for the end of the day, despite the plans I made, here I am…again! I can’t seem to avoid this place. No matter how much I may think I am going to avoid it, it pulls me back. I feel that unquenchable hunger to be here. I cannot stop myself from being here….at the gym. A year ago, a very similar internal dialogue played out in my head many times. I would leave work, headed for home, with plans for the evening, only to be pulled somewhere that I didn’t intend to be. Only a year ago, it would not have been the parking lot of the gym where I found myself. It would be the parking lot of the Walgreens to buy candy bars, or the drive through at McDonald’s, Burger King, Wendy’s, or Dairy Queen. This morning I decided to give myself an extra hour of sleep. When I do that, I pack a gym bag, and if my schedule permits, and I am not exhausted from working all day, I go to the gym on the way home. As I was wrapping up my work day I was thinking that I’d go straight home. The plan was to do some reading, and work on some blog posts that I have coming up on my other blog. I would help my wife with dinner and dishes, and even do some laundry. As I drove, I wasn’t even aware that I had skipped the exit for my house and was heading for the exit of the gym. I was listening to the radio, and had myself on autopilot, just like in the dialogue above. Only when I got on the treadmill did I remember that I had a different plan. One hour and 6km later, I stepped off the treadmill and dressed to go home. This post came alive in my head on the ride from the gym. I will still get all those other things done tonight, including making dinner with my wife. But first I worked out. It’s funny, the difference a year can make.
. As you can see, it is a good thing I forced myself to get up on Friday morning and go to the gym. I was feeling low that morning, and ended up taking a sick day from work, but it did put me over 500km. I decided to shut it down for the weekend, but I hope to be back and better than ever at the gym tomorrow. Since starting the challenge, I lost a total of 12.6 pounds. That included the time over the holidays, when I used my challenge as a way to keep myself going to the gym. I used my nephew’s basement treadmill over Christmas, and visited the fitness center in my hotel in New Orleans. I had some days were I went to the gym multiple times to keep pace. I increased my walking pace to 3.8 miles per hour, from the 3.5 where I started. I feel better than I have in years. For lent I had said that I would avoid all snacking, or all eating between meals. My wife noticed that I have been eating more at dinner than I usually would, and she thinks I may be over compensating for how hungry I am as a result of not spreading my eating out during the day. So, I am altering that commitment. Instead of not eating between meals at all, I am going to just eliminate 3 snacks from my list: nuts, popcorn and granola bars. I am not doing this to alter my diet. This is about self-sacrifice for the season, and self-denial. I will instead only eat fresh vegetables or fruit for snacks (all other snacks I have already essentially eliminated from my diet anyway). Today is weigh-in day. The scale shows me at 231.6 pounds. That is a 0.8 pound GAIN since last week. My total weight loss is now 113.4 pounds or 32.9% of my weight. There are still 2 days to go on the challenge, and I do intend to get walks in on both days. That should put me at just under 515km for the challenge. I will write more about the challenge on Sunday. I am disappointed this morning. I know that 0.8 pounds is not much to gain, but I was hoping that it would be in the other direction. With my lenten elimination of snacking, and my renewed emphasis on tracking my food, I am confident that things will continue to go well. But, that doesn’t change the disappointment I feel today.